On behalf of Suva Rugby we are grateful for the sponsorship and we are looking forward to this year’s Skipper Cup competition. 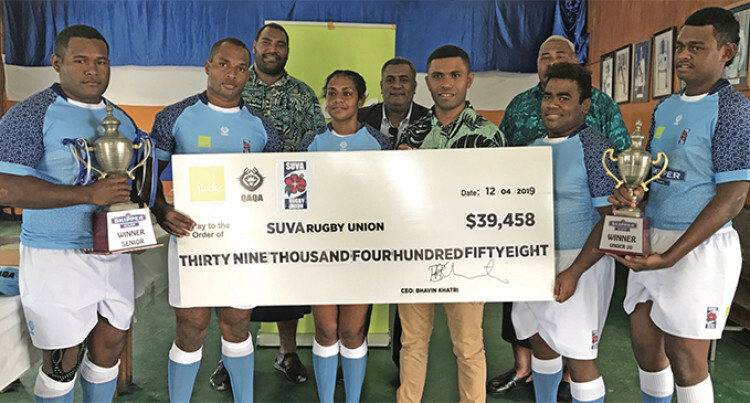 Defending Skipper Cup Premier champions Suva received a timely boost of $39, 458 from Jack’s of Fiji at the Fiji Naval Base in Walu Bay, yesterday. Speaking during the cheque handover, Suva Rugby Union Under-19 team manager Nemani Tuifagalele acknowledged Jack’s of Fiji for their continuous support. “We are grateful to Jack’s of Fiji for their third year of merchandise sponsorship,” Tuifagalele said. “And with such commercial entities coming on board has contributed towards the great achievements we’ve made. Also we proud to see how four of our players have don the Fiji Airways Flying Fijians jumper as well as the Fijian 7s side as well. “We are thankful to Jack’s of Fiji brand Qaqa for continuously assisting us. Jack’s of Fiji public relations officer Biu Tadranu said in the past Jack’s of Fiji is always happy to sponsor local teams. “We have witnessed the fruit of our sponsorship in the past two years. “And if you look at it from our point of perspective a local company supporting local clubs have led the way to creating a standard for players to compete at international level and that’s why we are so grateful. “Our sponsorship not only comes with the merchandise support but also we have cash sponsorship. We do royalty payment of the certain percentage of sales of the merchandise to the team.